Rock the City Festival 2013 will take place on 27-28 July in Bucharest, Romexpo parking. So far, from the line-up of Rock the City 2013 a few great bands have been officially confirmed. 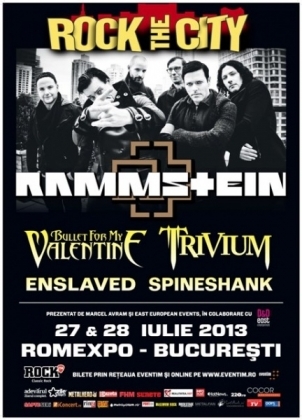 Among them, Rammstein (playing in Bucharest for the second time) and Bullet For My Valentine. Both concerts will take place on July 28, 2013, and according to the official website of the band Trivium, they will perform on the first day of the festival. In addition, organizers offered the first 5,000 fans who buy the ticket for the entire festival a 20% discount. Trivium, Enslaved and Spineshank also joined the Rock the City Festival 2013 line-up, as confirmed on March 18, 2013.